The Mosaic System and the Macrocosmic Cross. The image at the top is from "The Mosaic System and the Macrocosmic Cross" 1897 Latch. It is a scan of a reproduced black and white from the beautifully illuminated plate in the original "The New Light from the Great Pyramid," by author Albert Ross Parsons. It contains the Macrocosmic and Microcosmic crucifixions of Messiah. It is of ancient design beyond our age. 1897 PREFACE. In perusing the following pages it will be observed that the Mosaic system of interpretation, while in favor of progress, is not in harmony with Evolution as a process of growth due (to) resident forces; resident forces being considered as original spiritual endowments. With original spiritual endowments, Evolution, so-called, in essentiality is degeneration; for the visible growth of the creature's material body from the material elements about it, adds not an atom's weight to the aggregate mass; while the intensity of spiritual endowment will vary inversely with the multiplication of entities therefrom; resident forces discarding outside influences. This visible growth is a legitimate study, but does not, of necessity, cast away the progenitor. 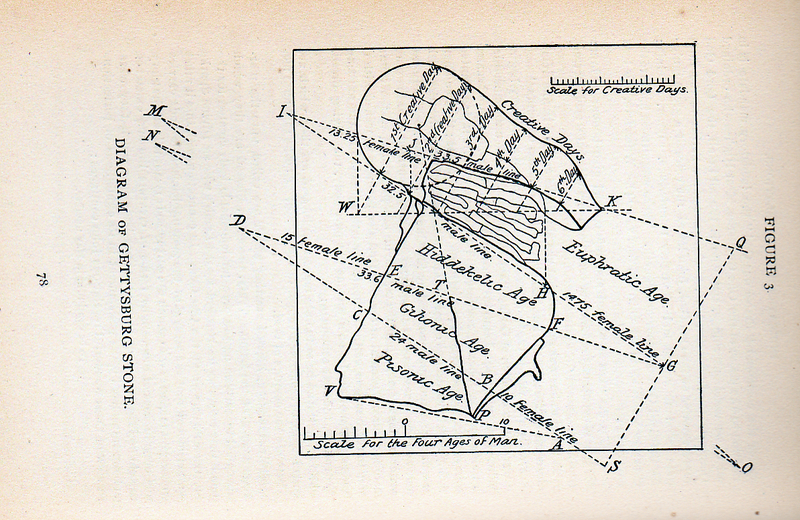 By one line of deduction, however, Evolution claims growth from the mineral to the vegetable; from the vegetable to the animal; and from the animal to the man, through resident forces, whereby the latest generation, as a spiritual embodiment, becomes perfect, and, finally, re-absorbed into the Infinite Source from whence it sprang. In contradistinction to this the Mosaic System holds to the form that God's great purpose involves the peopling of space by hosts innumerable as the sands of the sea, and as the dust of the earth; hosts that have been enrolled under the banner of the Most High, and which have been honored as participants in the terrible struggle that proved Evil to be Evil. In this light the progenitors became soldiers, with life and existence cherished, not castaways, and in the re-appearance once more will take their places in the rank and file that swept the warpaths, counting from the very van of time. Still more, the system God Mosaically proclaims from every house-top strikes through "Kirjath-sepher," the old, old city proud with letters mystic, grand, and rare, thus forcing even heaven's vaults to yield their witness to the One who nobly came, who fought, and overthrew the Midnight King, the common Foe to all. Hence, neither does the Mosaic System agree with reincarnation as a mode of progress pertaining to the creature; but in distinction from the creature, Christ, the Messiah, was reincarnated in his manifestations as the Son of man, and as the Seed of woman. The reincarnation of Messiah as the Son of man is fully authenticated in the books of the Old Testament and substantiated in the New; the object involving the self-assumption of the transgressions of the creature world, through the flesh of the creature world, that the penalty of transgression be paid in the same, lest, against justice, the innocent suffer for the guilty. In essentiality the spirit of the creature world is regenerated, not reincarnated; that is, the spirit of the creature born or generated in the earthy body (material) is reborn into and regenerated in the pure, unblemishable body (spiritual) created in the beginning of the Creation suitable for such occupation. Hence, the labors of Messiah being paramount, general reincarnation becomes unnecessary; more especially since progress in the spiritual body is more perfect than in the earthy. Reincarnation also limits multiplication; while multiplication is a Divine edict bearing upon the ultimate peopling of space with intelligences, and with the eternal sparklings of the inanimate. Owing to the transmission of blood and characteristics, however, the spirit of the progenitor still remains identified with the offspring. This may be construed to mean reincarnation, but even by such construction the spirits of both progenitor and offspring are independent of each other; each to reappear in the spiritual semblance of its material existence, yet subject to spiritual progression. In connection with this thought it must be considered that blood is the life; life is the Divine Spark; and that the Blood — the Divine Spark — shall not be eaten, it being God's endowment to the creature. From this point of view the Macrocosmic Crucifixion of Christ the Messiah symbolizes the crucifixion of the creature world in Christ; and, also, that through the absolute death of Christ the Microcosmic Cross symbolizes the absolute death of the creature world in Christ. From this absolute death nothing evil can return; but, clothed with the pure, unblemishable body, the Divine Spark that gave life and existence to the creature world can, and must return from the pit with the resurrection of Him in whom they dwell, the blemished earthy being left behind forever. It has been determined from the Mosaic interpretation of the Gettysburg Stone that upon the 2nd creative day the plane of Earth's orbit was displaced 18 degrees from the normal position it occupied on the 1st creative day; and that upon the 4th creative day it was displaced 46 degrees from the abnormal position it attained on the 2nd day, yet in a direction opposite the first deflection, and, consequently 28 degrees from the normal of the 1st day. The displacement of Earth's orbit has, in brief, been defined by numerous writers, ancient and modern, as a Macrocosmic crucifixion symbolizing the Microcosmic crucifixion of Jesus, the Christ, the son of the Virgin. But to elucidate according to the Mosaic System the position thus advanced, and thereby obtain harmonious results, let the 46 degrees set forth above represent the 12 months of the Melchizedician Year (see Melchizedician Chart), and let 18 degrees and 28 degrees be subdivisions of the same. Now, by the Melchizedician Chart, the birth of Jesus occurs in August, while August corresponds with the 5th month of the Melchizedician Year, and by the Hebrew calendar with the month Ab. Wherefore, as on the 2nd creative day the plane of Earth's orbit was displaced 18 degrees from the normal it occupied on the 1st day, so a new departure of Earth is established, whereby the Macrocosmic Cross is brought into notice as a symbol or prototype of the Microcosmic Cross of Jesus. For by proportion (1) as 46:18::12:4.7, which as months, corresponds with the, midst of the 5th month of the Melchizedician year as set forth above. As, therefore, 4.7 months — the fourth term of Macrocosmic proportion (1), — correspond with the 5th month of the Melchizedician Year, and as the 5th month of the Melchizedician Year corresponds with the August of our system, so the Macrocosmic Cross, when thus read, also reveals August as the month in which Christ, the Messiah, made a new departure; manifestly in his birth, advent or personality as Jesus, the Son of the Virgin. Also, by Macrocosmic proportion (2), viz., as 46:28::12:7.3, some other historic symbol, month or time point in the life of Christ, the Messiah, is brought into notice. Wherefore, as on the 4th creative day the plane of Earth's orbit was displaced 28 degrees from its normal of the 1st day (see also Macrocosmic crucifixion in "New Light from the Great Pyramid," p. 227, — Parsons), and a new departure of Earth exhibited, so the Macrocosmic Cross is again brought to notice as a symbol or prototype of Messiah in his manifestation as Jesus. Accordingly, the 7.3 months of the 4th term of Macrocosmic proportion (2) correspond with the midst of the 8th month of the Melchizedician Year; while the 8th month of the Melchizedician Year corresponds with October-November of our system, and with Marchesuan or Bui of the Hebrew calendar. The 3rd month of the Melchizedician Year, however, also corresponds with the 3rd creative day. As, therefore, on the 3rd creative day the land emerged from the waters which encompassed it, and as Earth then brought forth herbs, fruitbearing trees, and verdure in abundance, so, in harmony therewith as an archetype, Jesus, the Christ, after his three days' encompassment in the depths, rose from the dead bringing with him the fruits of his great labors, an abundant store fitted and destined for eternity. The two Macrocosmic crucifixions, however (for one ray of simple history can have several harmonious solutions), may also symbolize the two times Messiah set his hand to recover his people (see Isa. xi. 10-16.) The first of these relates to his labors as the Son of man in the Old Testament days, in which (see 1 Kings xxi; Ps. xlix. 20, 21, lxxxix. 15) a hidden crucifixion or death of Messiah as the Son of man took place. The second time pertains to Messiah as Jesus, the son of the Virgin, in the New Testament days, during which (see St. Matt, xxvii. 33-35; Ps. xxii. 16, 31) the open crucifixion or death of Messiah as Jesus took place. In this light the Macrocosmic crucifixions of the 2nd and 4th creative days foreshadow the two Microcosmic crucifixions of Messiah in his wonderful manifestations as the Son of man, and as the Seed of woman. The first culminates in descent into the valley of the shadow of death; the second, in absolute death; both of which Messiah fulfilled in perfecting his redemptive and subjugatory labors. In support of these advancements there appears, in harmony with the foregoing, as 46:18::7860:3075 or to the approximate date of the crucifixion or death of Messiah as the Son of man, male line, Pisonic age, or about the year B.C. 855. This death, therefore (MSS. "Indications of 1 Kings" and of "Romans") finds fulfillment in that of Naboth, the Jezreelite, as Messiah, the Son of man, the Seed of Jehoshaphat, King of Judah. By reincarnation Messiah became the Seed of Joram or Jehoram, King of Judah, the son of Jehoshaphat. Consequently, in the reappearance Messiah was manifest as Elisha, the son of Shaphat, even as Jehoram was the son of Shaphat = Josaphat = Jehoshaphat. Inasmuch, however, as Elisha did not change his tabernacle during the reigns of Ahaziah, Joash, and Amaziah, so these three Kings of Judah do not, and cannot appear in the true genealogy of Messiah as Jesus Christ, the Son of David, the Son of Abraham (see St. Matt. i. i — 17), although they can appear in the genealogy of the Virgin. There further follows from the Melchizedician Year, as 46:28::6550:3986 or to the approximate date of the crucifixion or death of Messiah as Jesus, the son of the Virgin, female line, Pisonic age, against the 3930 of the Mosaic System. This approximation may be considered very close to that accredited by historical research. Now, in continuation of the Macrocosmic Cross, facing page 264 in his "New Light from the Great Pyramid," Mr. Albert Ross Parsons gives a beautifully illuminated plate of a Messianic crucifixion, to which the Zodiac and Solar Systems are appended. This relic, which Mr. Parsons so judiciously introduced into the above mentioned work, was, he states, obtained from a Roman Catholic calendar; but the following elucidation of its esoteric meaning is given by the present writer through the Mosaic system of interpretation. Wherefore (see cut), by the Mosaic System, Messiah nailed to the cross represents the Macrocosmic crucifixion of the "Lamb slain from the foundation of the world," and, hence, it finds place in the beginning of the Creation. The great circle of the Zodiac represents the world in its universality; the 120 divisions in the circumference thereof memorialize the 120 divisions in the Battle-Ranks of the Children of Israel, (MS. "Indications of Judges"); but they may also be used as a scale, three to each, representing the 360 degrees of the great circle. The creation of the world (see Messianic Chart) was begun in the Zodiacal sign Pisces; the first-fruit of the Creation being the pure unblemishable body which, later, became the Living Bread. 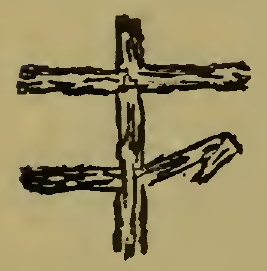 As with the Messianic Chart, so with Macrocosmic crucifix; the feet of the "Lamb slain from the foundation of the world" are seen at the intersection of Aries and Pisces. In connection with these Zodiacal signs a tree is seen, whose fruit on the one hand symbolizes the pure, unblemishable body as the Bread of Life, and on the other, a censer burning with incense. The censer burning with incense symbolizes and foreshadows the trials and tribulations of Messiah in his subjugatory and redemptive labors. Messiah's labors, although abounding with pain and suffering, ascend as a sweet-smelling savor to the Most High God; for out of them the fulness of glory is accomplished. It will be observed that each member of this tree carries six main branches. These six branches memorialize the six creative days from the beginning thereof to their intersection with the Four Ages of Man; while the Four Ages of Man are memorialized by the four points seen on the crown of the Lamb slain. The Four Ages are further represented by the four leaves at the intersection of the arms of the Cross. In addition, the Three Persons of the Trinity, and the fulness of each in the one, are represented by the three triple-pointed staffs which garnish the head of the Cross. It will be inferred, however, from the inscription above Messiah's head, and from the names of the planets of the Solar System, that this relic is a modern conception. But that the general design is very ancient, and that it foreshadows the Microcosmic crucifixion of Messiah as Jesus, is manifest from the Mosaic interpretation of a Cuneiform inscription on a tablet unearthed at Nippur by the Babylonian Expedition. This tablet, according to expert Assyriologists, takes rank as the second oldest record ever found in the world, and dates as far back as B. C. 3800. Wherefore, by the Mosaic interpretation of this ancient record in the 3rd division thereof as pertaining to the Pisonic or 4th Age of Man, in the 17th division thereof as pertaining to the Grand Epoch from the beginning of the Creation, in the division or epoch Messiah appeared as the Son of man and as Jesus, the Christ, the Tree of Life is symbolized, and, also, the Macrocosmic Cross. The latter (see sketch) is almost, if not quite identical in shape with the crucifix under consideration. Hence, by time, shape and history, the Assyrian Tablet proves the antiquity of a design which, at first sight, appears to date no earlier than A. D. 34, whereas it is some 4000 years older. The relationship between the Macrocosmic and Microcosmic crosses, having thus been shown, the Solar System connected therewith now comes forward for investigation. As, therefore, in many ancient relics the north corresponds with the south-east of our charts, so in the Solar System or Planisphere under consideration, the north finds place or corresponds with our southeast, and the other points of the compass accordingly. Now, by the Messianic Chart the birth and Microcosmic crucifixion of Jesus occurred in the Zodiacal sign Scorpio, at or about its intersection with Libra; while by the Melchizedician Chart the birth of Jesus occurred at or about the intersection of Taurus and Aries. The seeming discrepancy between these two charts may, however, be reconciled through the history they are intended to symbolize. For we read, St. Matt. ii. i, 2, "Now when Jesus was born in Bethlehem of Judea in the days of Herod the king, behold, there came wise men from the east to Jerusalem. Saying, Where is he that is born King of the Jews? for we have seen his star in the east, and are come to worship him." Wherefore, by inspecting the Planisphere a great-star is seen in the east near the intersection of Taurus and Aries, which clearly corresponds with the one the wise men saw in the east; thereby identifying Taurus-Aries with the birth of Jesus according to the Melchizedician Chart. From the east to the west, therefore, from Taurus to Scorpio the wise men travelled till they found Saturn, the double star, that stood over where the young child was with Mary, his mother, the latter being symbolized by the planet Venus. Here, then, in the Planisphere, Saturn and Venus are seen in conjunction with Scorpio; while in the same plane, the far-distant Uranus, — mythologically the most ancient of gods, — the star of Him who was called "King of the Jews," — the Word which was in the beginning with God, — together with Taurus, is found mysterious, grand, and true. It is quite probable that the "wise men" fully comprehended the conjunctions of the planets with the signs of the Zodiac, and their bearings as identified with the birth and anterior history of Jesus; the symbol of each planet being constructed with a cross. Moreover should the Planisphere be turned on its centre until the midst of Taurus coincides with the extreme point of Scorpio, at or about which time Jesus was born, then it will have passed through 195 degrees. Now if from the arc thus subtended the angle be drawn to the circumference as in relation to some required ecliptic, it will measure 97 degrees 30 minutes, thereby corresponding almost exactly with the astronomical 98 degrees axial displacement of Uranus, the star seen in the east by the "wise men." In Scorpio, therefore — how well the name befits — the young child grew and met his foes. The vanquishment of foes was not all that Judah's King came hither to fulfil; for out from Scorpio the Bread of Life appears, — not one as at the first, but many in one; each individuality a unit of itself, and yet as part and offspring of the one. Christ is the One, the King of Judah is the One; and from Him as the Living Bread spring forth the many clothed in raiment durable as ever and forever; the habitat wherein the living spiritual being lodges through eternity. Through Christ the priest Melchizedician, and through Melchizedek himself, rebirth finds place till many in the One defies the seashore sand and dust of Earth for number. 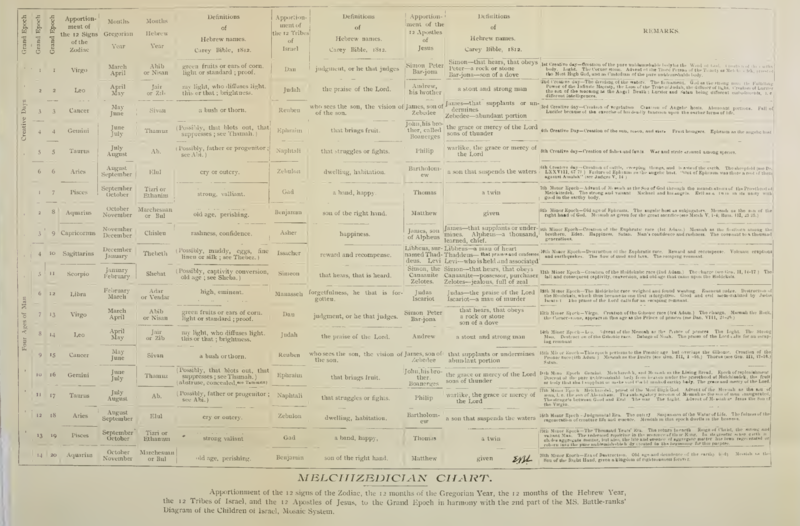 Now (see Messianic Chart), in the Zodiacal sign Leo, Messiah becomes manifest as the Son of God. It was at or about this time, — in Virgo, — that (see Rev. xii. 1-9) there appeared in heaven a woman clothed with the sun, the moon under her feet, and upon her head a crown of twelve stars. She, being with child, pained to be delivered. A great red dragon also appeared in heaven and he stood ready to devour the child as soon as it was born. This child, — which is the Lion of Judah — was to rule all nations with a rod of iron. And there was war in heaven. Michael and his angels fought against the dragon and his angels. As, therefore, by the Messianic Chart, these wondrous events occurred in Virgo-Leo, so the same is manifest in the Planisphere under consideration; for therein Leo is due north; the sign of the lion denoting the Lion of the tribe of Judah. The insignia of the future ruler as King are represented in and by the adornments of the trible-pointed crown projecting from his Zodiacal sign. It will be observed that the drooping points of this crown correspond in number with those encircling the head of the "Lamb slain." Wherefore, in historical harmony with this epoch and sign, the great red dragon is symbolized by the fiery comet with its long train of servitors; while in near conjunction Mars as God of war becomes significant of the struggle between Michael and the dragon. Now (see Planisphere), a plane from the north cut through Leo, the comet, and the sun, also cuts through Mercury, Jupiter, and Aquarius in the south. By the Messianic Chart Aquarius finds place in the south; the term south, by the Mosaic System, representing the Gihonic or 3rd age of man, even as the north represents the Euphratic or 1st age of man. During the latter part of the Gihonic age (see Dan. viii. 21-25) "a king of fierce countenance, and understanding dark sentences, shall stand up against the Prince of princes; but he shall be broken without hand." This war becomes a counterpart of the war of Michael and the dragon that took place in the early days of the Euphratic age; at which time the dragon sought to destroy Messiah, the young child. 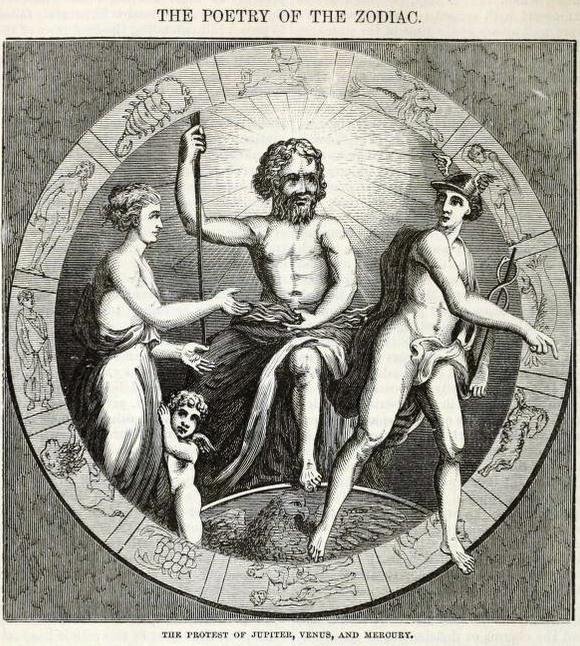 But in the south (see Planisphere) Jupiter, — mythologically the father of men and gods, — represents the Prince of princes; and Mercury, — mythologically the patron of thieves, — which is in conjunction with Jupiter, represents the dark opposing power that warred against the Prince of princes in the latter part of the Gihonic age. The latter part of the Gihonic age, as already intimated, is represented by the sign Aquarius. Wherefore, should the Planisphere be turned on its centre until Leo coincides with the place occupied by Aquarius, with Jupiter in conjunction thereto, it will have passed through 180 degrees. But if from the arc thus subtended the angle be drawn to the circumference as in relation to some required ecliptic, then it will measure 90 degrees; the displacement exactly corresponding with the 90 degrees axial displacement of Jupiter, the conjunctional star, as accorded by the later astronomy. But should Leo continue from Aquarius and pass through Scorpio, then a further displacement of 120 degrees would ensue. At the end of Scorpio, however, Messiah, the Lion of the tribe of Judah, is crucified, and at or about which time Saturn, the double star, also seen by the Magi, is in conjunction with Scorpio. If, now, from the arc of 120 degrees the angle be drawn to the circumference as in relation to some required ecliptic, then it will measure 60 degrees, which corresponds exactly with the 60 degrees axial displacement of Saturn, the conjunctional star, as accorded by the later astronomy, thereby symbolizing a Macrocosmic crucifixion of the Lamb coincident with the Microcosmic crucifixion of Jesus. Through these displacements, herefore, the path of Messiah as the Son of God is astronomically traced from the beginning of the Euphratic age down into the Gihonic age, and from the Gihonic age, into the Pisonic, where he becomes identified in Scorpio as Jesus, the son of the Virgin. The wonderful episode pertaining to the Gihonic age, asset forth above, has also been allegorically preserved in a magnificent Roman gem, a cut of which can be seen in Harper's Magazine, Vol. xliv. p. 258. The Melchizedician Chart, Mosaic System, gives a clear, harmonious interpretation of its hidden meanings. In pursuing the indication that the sign Aquarius relates to the latter part of the Gihonic age, and, hence, to the Deluge of Noah (see Messianic Chart), Virgo becomes apportioned to the 1st division of the Euphratic age, in which the woman clothed with the sun appeared, and at or about the time that Messiah was begotten as the Son of God (see Rev. xii. 1-4). Leo becomes apportioned to the 2nd division of the Euphratic age, in which the war in heaven took place. Cancer finds apportionment in the 3rd division of the Euphratic age, in the beginning of which man of Adam's race (white) was created. Gemini, the twins, finds apportionment in the 4th division of the Euphratic age, or the division that overlaps the Hiddekelic age; hence, the twins. Taurus becomes apportioned to the 1st division of the Hiddekelic age, in the beginning of which, the Red race (2nd Adam) was created. The beeve really pertains to the Euphratic age (MS. "Indications of Leviticus" ) but his apportionment in the Hiddekelic symbolizes the transmission of blood and characacteristics. Aries falls to the second division of the Hiddekelic age, the division that overlaps the Gihonic age. Pisces falls to the 1st division of the Gihonic age, in the beginning of which the Black race (3rd Adam) was created. The two fishes of this sign not only represent the overlap of the Hiddekelic and Gihonic ages, but, being coupled together with a throng, they symbolize the unity of these two ages in numerous historic relations. Aquarius, as already set forth, is apportioned to the 2nd division of the Gihonic age; and bears relation to the Deluge of Noah as well as to Messiah in his personality as the Prince of princes. Capricornus, which is frequently represented by a goat's head and body, with a fish's tail, becomes apportioned to the 1st division of the Pisonic age, in the beginning of which the Pale race (4th Adam) was created. But inasmuch as this division overlapped the Gihonic age, and as, with the exception of the escaping remnant, the people were swept away in the cataclysm that destroyed the Gihonic race, so Capricornus as symbolic of the Flood, and of the overlap of the Gihonic and Pisonic ages, is represented as an amphibion. After Capricornus comes Sagittarius, in which the Bread of Life was brought forth by Melchizedek, and hence, becomes the Epoch of Replenishment. After Sagittarius comes Scorpio, the epoch in which, as already set forth, Messiah, the Living Bread, fulfilled the will of God in his missions as Subjugator and Redeemer. After Scorpio comes Libra, in which all hosts are brought to judgment; beginning with Christ, the Messiah, continuing with Satan, and ending with Lucifer, the angel Death. With the second advent of Virgo, the Thousand Years' Era is ushered in, when a new year begins. After Virgo, Leo reappears. With Leo Time ends, when Messiah, the Lion of the tribe of Judah, returned to the Father, enters upon his eternal reign of triumph. It has been stated that Pisces found place in the beginning of the Creation. 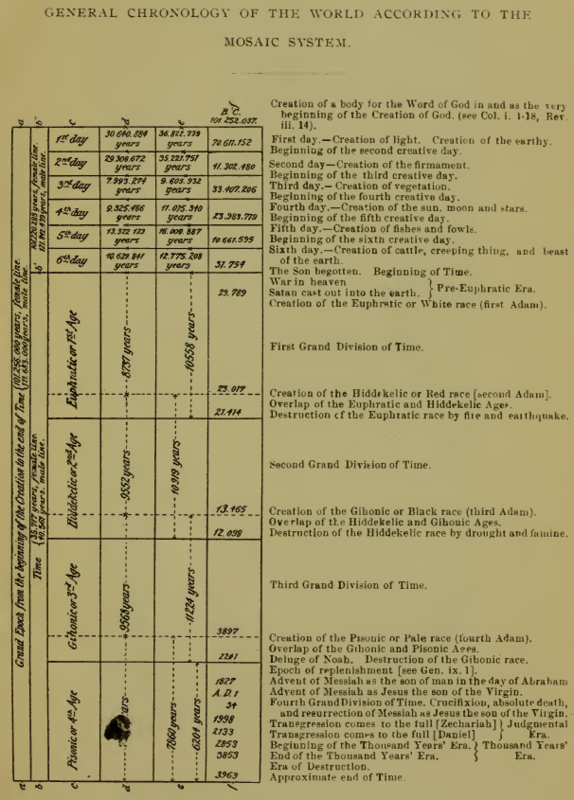 Hence, it represents the 1st creative day (see Messianic Chart). By sequence Aquarius represents the 2nd creative day; Capricornus, the 3rd day; Sagittarius, the 4th day; Scorpio, the 5th day; and Libra, the 6th creative day. It also has been stated (see Gettysburg Stone) that on the 2nd creative day a great cataclysmial development took place by which Earth's orbit was displaced 18 degrees from its normal plane of rotation; and that on the 4th day Earth's orbit was displaced 46 degrees from the abnormal position attained on the 2nd day. Further, that these displacements brought to notice two Macrocosmic crucifixions of Messiah, the Lamb. 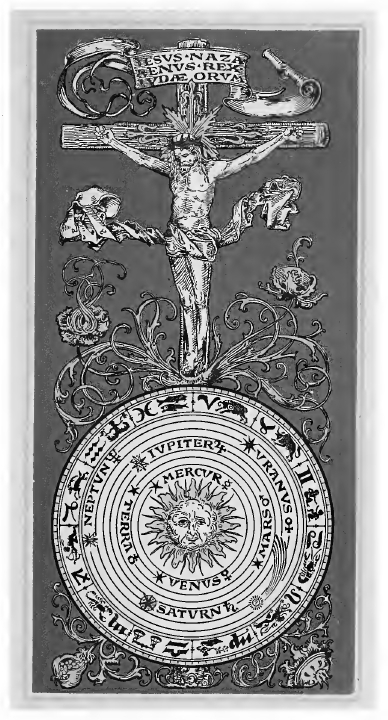 Now, let the sun in the Planisphere represent Alcyone of the Pleiades as a centre around which all matter revolves, and let the Zodiac be represented by the 12 signs as with the Solar System; Pisces, as before, in the beginning of the Creation, yet under the feet of the "Lamb slain from the foundation of the world." From the positions thus set forth, and with Alcyone as the centre, let the Planisphere be revolved until the 2nd day, with Aquarius as the Water of Life, comes immediately under the feet of the Lamb slain, when it will be found, that a displacement of 37 degrees 30 minutes has taken place. Wherefore, if from the arc thus subtended the angle be drawn to the circumference, it will measure 18 degrees 45 minutes, thereby symbolizing and agreeing with the 18 degrees displacement that befell Earth on the 2nd creative day as has already been set forth, Earth, in the Planisphere, being in conjunction with Aquarius. Further, from the new position let the body of Aquarius, the Waterman, be fully drawn in, when the Macrocosmic crucifixion of Messiah, the Water of Life, in its identity with the 2nd creative day, becomes graphically manifest from its similitude o the Macrocosmic crucifixion above it. In continuation, let the Planisphere be revolved until the head of the Bowman, — Sagittarius representing the 4th day, — comes under the feet of the Lamb slain, when it will be found that the Planisphere has passed through a total of 3.5 degrees in its identity with the 4th creative day. If, now, from the arc thus subtended the angle be drawn to the circumference, then it will measure 46 degrees 45 minutes, thereby symbolizing and agreeing with the 46 degrees displacement of Earth's orbit on the 4th creative day, as otherwise determined. The Macrocosmic crucifixion thus brought to notice clearly foreshadows the Microcosmic bruising of Messiah's heel and of the Serpent's head — "upon thy belly shalt thou go" — in the Pisonic age as called for by Gen. iii. 14, 15; St. Luke xxii. 3, 4. But prior to this bruising the Bread of Life appears in Sagittarius, Pisonic age, as the Epoch of Replenishment. This epoch is the 16th minor epoch of the Grand Epoch from the beginning of the Creation (see Messianic Chart), the same being symbolized in the Planisphere by the 16 broad rays radiating from Alcyone as the central sun. According to the Mosaic System, as set forth above, the Bread of Life was brought forth by Melchizedek, priest of the Most High God, in the Pisonic age, in Sagittarius as the 16th minor epoch of the Grand Epoch. At the intersection of the 16th and 17th minor epochs of the Grand Epoch; that is, at the intersection of Sagittarius and Scorpio, Melchizedek, priest of the Most High God, met Abraham returning from the slaughter of the Kings, and brought forth bread and wine. From the magnitude and holiness of the Melchizedician priesthood the bread thus brought forth, as already intimated, was the Bread of Life, the Pure, Unblemishable Body that had been created for the Word of God in and as the very beginning of the Creation. At the intersection of Sagittarius and Scorpio, therefore, this Pure Body, this Bread of Life, was broken for the first time by Melchizedek, and given forth as the spiritual body into which the spirits of the creature world are regenerated or reborn. This breaking of the Bread of Life, this breaking of the pure body of Christ, also constitutes a crucifixion of Christ. Wherefore, (see Messianic Chart), inasmuch as the Messianic Year begins with Virgo, let the Planisphere be revolved from and including Virgo as from the feet of the Lamb slain, until the cross in Sagittarius comes under the Macrocosmic Cross, when it will be found that a displacement of 291 degrees has taken place. But if, as before, from the arc thus subtended the angle be drawn to the circumference, as in relation to some required ecliptic, then it will measure 145 degrees 30 minutes, thereby exactly corresponding with the 145+ degrees displacement of the planet Neptune as accorded by the later astronomy; while Neptune, by the Planisphere, is in conjunction with Sagittarius, thus further substantiating the esoteric meaning of the Macrocosmic Cross, and the advent of the Living Bread in the Pisonic age. 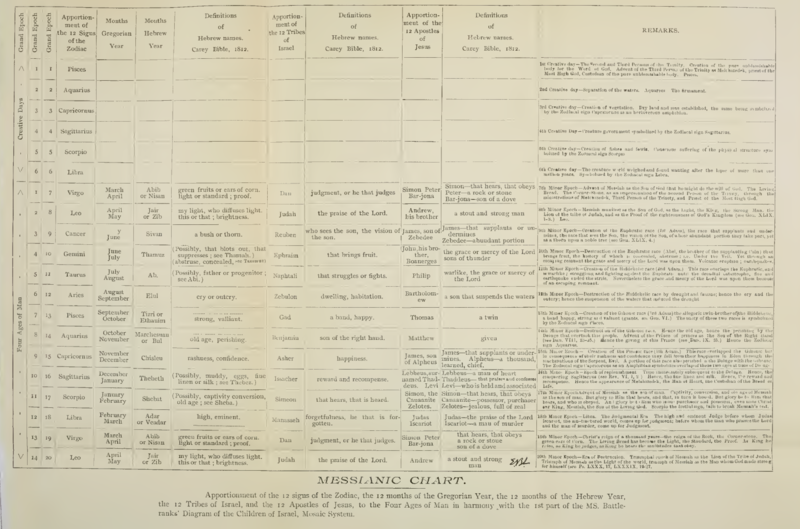 Further, the end of the Pisonic age (see Messianic Chart) is represented by the Zodiacal sign Leo, while Messiah's labors as the son of man began with Scorpio. As therefore, the Pisonic age is the manifest battlefield of Messiah as Subjugator (see Gen. iii. 14-16), so four divisions thereof as represented by the Zodiacal signs commencing with Scorpio and ending with Leo, will bear witness of the strife between those two marvels of power, Messiah and Satan. Wherefore, by revolving the Planisphere from Scorpio to Leo inclusive, it will have passed through 120 degrees. But if, as heretofore, from the arc thus subtended the angle be drawn to the circumference, as in relation to some required ecliptic, it will measure 60 degrees, thereby corresponding exactly with the 60 degrees displacement of Mars as accorded by the later astronomy; while Mars as the god of war (see Planisphere) is in conjunction with Leo, the constellation and epoch under immediate consideration, in which the last war-shout of Satan will be heard. By what has gone before, the Grand Epoch from the beginning of the Creation to the end of the Four Ages of Man, and the Four Ages of Man, themselves, are brought into notice as two independent chronological magnitudes. The ratio between these two magnitudes, viz: 3000, has been established from numerous ancient works, among which Soloman's Temple, Stonehenge, the Great Pyramid, and the Gettysburg Stone, may be mentioned. In the ancient relic now under consideration this witness is not found wanting, for the distances from the foot of the Cross to the Planisphere (see cut), and from the feet of the Lamb slain, as resting on the Planisphere, to the top of the cross-arm, when measured by sixteenths of an inch, are 2.64 and 38 respectively. As, therefore, the perfect labors of Messiah are represented by a perfect cube, and as these special labors pertain to the creature world from the beginning of the Creation, so the cube in which the Lamb slain appears will represent the Grand Epoch, and the cube at the extreme foot of the Cross will represent the Four Ages of Man, during which, as the Son of God, Messiah came and fulfilled the will of God. Wherefore, by the representative values, 2.64 cubed = 18.3997; and 38 cubed =54,872. 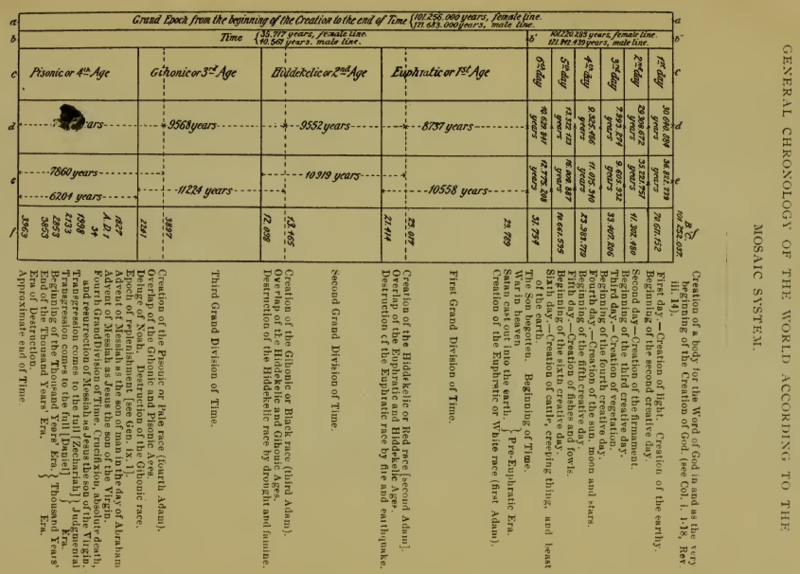 Hence, by proportion, as 18.3997:54,872::1:2982 or to the ratio between the Grand Epoch and the Four Ages of Man; thereby corresponding with the 3000 otherwise obtained. The Macrocosmic Cross also symbolizes the Four Ages of Man; the upper arm representing the Euphratic age; the crossarm representing the Hiddekelic and Gihonic ages combined (see, also, the symbolism of Pisces); and the post between the crossarm and scarf representing the Pisonic age. Now, by sixteenths of an inch, as before, it will be found that these symbols measure 14, 38.5 and 13.5 respectively; 38.5 corresponding with the 38 already obtained as a second measurement of the Macrocosmic cube (see, also, Hindu Macrocosm, "New Light from the Great Pyramid," p. 221, — A. R. Parsons) the mean of which is 38.25. It must also be taken into consideration that the great image of Nebuchadnezzar's dream represents the Four Ages of Man; and that the feet and legs thereof symbolize the Pisonic age. In harmony with the symbolism of this image the corresponding measurement in the Macrocosmic Cross, as a second witness, agrees with the 13.5 already set forth. As, therefore, by one line of interpretation the years of the Pisonic age, female line of chronology, Mosaic System, are 6550, — that is 7860 minus the redemptive fifth, — so by the symbolic values of the Cross there follows as 13.5:14::6550:6792 or to the years of the Euphratic age from the creation of the Euphratic race, female line of chronology, against the 6772 of the Mosaic System. Also, as 13.5:38.25::6550:18,558 or to the years of the Hiddekelic and Gihonic ages combined against the 19,120 of the Mosaic System. Consequently, 18,558/2 = 9279 as the years of the Hiddekelic age, female line, against the 9552 of the Mosaic System. Also, 18,558/2 = 9279 as the years of the Gihonic age, female line, against the 9568 of the Mosaic System. Also, by totals, as 13.5:65.75::6550:31,900 or to the years of the Four Ages of Man, female line, against the 32,442 of the Mosaic System. Wherefore, the ratio between the Four Ages of Man and the Grand Epoch being 3000, there follows 31,900 X 3000 = 95,700,000 as the years of the Grand Epoch from the beginning of the Creation to the end of the Pisonic age, female line, against the 97,326,000 of the Mosaic System. For the male line of chronology there appears as 13.5:14::7860:8151 or to the years of the Euphratic age from the creation of the Euphratic race, against the 8375 of the Mosaic System. Also, as 13.5:38.25::7860:22,270 or to the years of the Hiddekelic and Gihonic ages combined, against the 22,143 of the Mosaic System. Also, by totals, as 13.5:65.75::7860:38,281 or to the years of the Four Ages of Man combined, from the creation of the Euphratic race, against the 38,378 of the Mosaic System. If, now, the Mosaic link from the beginning of the Euphratic age until the creation of the Euphratic race be added there appears 38,281 + 2183 = 40,464 as the longevity of the Four Ages, male line, against the 40,561 of the Mosaic System. Consequently, 4o,464 X 3000 = 121,392,000 years as the longevity of the Grand Epoch from the beginning of the Creation, against the 121,683,000 of the Mosaic System. The proportionate lengths of the 6 creative days, however, are symbolized in the Macrocosmic Cross (see cut) by the 6 parts of the scroll work attached to the band bearing the inscription pertaining to Jesus as the "Lamb slain from the foundation of the world." Of these 6 parts the two long pennants on the left represent the 1st and 2nd creative days; the broad one indicating chronology through the male line; while the narrow one indicates chronology through the female line. The small pennant identified with this group represents the 3rd creative day. It will be observed that the wave-like construction of these symbols is suggestive of the flowing vaporous condition of aggregate matter during the earlier creative days. In contra-distinction to this the 4th, 5th and 6th creative days are represented by 3 straight lines constructed or drawn through the 3 parts of the scroll on the right of the inscription. As, therefore, by the Mosaic System the longevity of the 6th creative day, female line, comprehends 10,000,000 years, and as the 6th day is represented by that portion of the scroll that is unrolled, so let a straight line, conceived to be drawn through its extremes, be divided into 10 parts or divisions, each part or division representing 1,000,000 years as a scale for measuring the longevity of the 5 remaining days. Now the 5th creative day is represented by the broad portion of the scroll on the right. Wherefore, a straight line drawn through its extremes will measure 13 divisions of the scale, thus giving 1,000,000 X 13 = 13,000,000 years as the length of the 5th creative day, female line, against the 13,000,000 of the Mosaic System. Should, however, the lower margin be measured, then it will correspond with 16 divisions of the scale, thereby giving 1,000,000 X 16 = 16,000,000 years as the longevity of the 5th creative day, male line; against the 16,000,000 of the Mosaic System. The 4th creative day is represented by the narrow projection immediately above the broad band just considered, together with its base. In harmony with the preceding, a right line drawn through its extremes will measure 9 divisions of the scale, thereby giving 1,000,000 X 9 = 9,000,000 years as the longevity of the 4th creative day female line, against the 9,000,000 of the Mosaic System. The 3rd creative day is represented by the short pennant on the left of the inscription. This pennant measures 8 divisions of the scale, thereby giving 1,000,000 X 8 = 8,000,000 years as the longevity of the 3rd creative day, female line, against the 7,993,000 of the Mosaic System. The 2nd creative day is represented by the narrow sinuous pennant, which, when measured, in its sinuosity, gives 30 divisions of the scale as the approximate length thereof, thus indicating 1,000,000 x 30 = 30,000,000 years as the longevity of the 2nd creative day, female line, against the 29,308,000 of the Mosaic System. The 1 st creative day is represented by the broad pennant. This streamer, when measured along the top edge in its sinuosity, gives 36 divisions of the scale as the approximate length thereof thus indicating 1,000,000 X 36 = 36,000,000 years as the longevity of the 1st creative day, male line, against the 36,000,000 of the Mosaic System. Should, however, the lower edge of this pennant be considered, then it will measure 31 divisions of the scale, thereby giving 1,000, 000 X 31 = 31,000,000 years as the longevity of the 1st creative day, female line, against the 30,640,000 of the Mosaic System. The indication now follows that inasmuch as by the Mosaic System the lengths of the 6 creative days are to each other as the numbers 23, 22, 6, 7, 10, and 8, so, also, the same numerical relation is manifested in the Macrocosmic Cross under consideration. In continuing by the Mosaic System of interpretation, the two flowing portions of the scarf encompassing Messiah's body, symbolize the crucifixion of Israel and Jeshurun; the crucifixion of the Creature World as represented by the two great cubes; the crucifixion of the thousands of Manasseh and the ten thousands of Ephraim, on the Microcosmic Cross of Jesus, the Christ; the same being hidden in the destruction of the Temple of the Philistines, conjoined with the death of Samson — "Suffer me that I may feel the pillars whereupon the house standeth," — but is more openly manifested in the Microcosmic death of the two malefactors crucified with Jesus, the Macrocosm. The inferences now arise that the Macrocosmic Cross under consideration antedates the Microcosmic crucifixion of Jesus, else the Assyrian chronology as derivable from the Babylonian Tablet, goes not beyond the year A. D. 34. Also, that the existence of, and the axial displacement of the planet now called Neptune was well-known to peoples far back of A. D. 1846, the accredited date of its discovery by modern astronomy. Wherefore, in summing up the wonders concealed in this most precious and sublime relic, it contains the Macrocosmic and Microcosmic crucifixions of Messiah. Also, the aggregate years of the Grand Epoch, and the years of each creative day separately. Also, the aggregate years of the Four Ages of Man, and the years of each age separately. Also, the ratio between the Grand Epoch and the Four Ages of Man. Also, the axial displacements of the planets Earth, Uranus, Jupiter, Saturn, Neptune, and Mars, together with their relationship to the Macrocosmic and Microcosmic crucifixions of Messiah. It contains, also, the Tree of Life with its fruit, the Bread of Life. Also, the Tree of Evil with its symbol of pain and tribulation from the beginning of the Creation. Also, the advent of Messiah as the Son of God in the Euphratic age; the advent of Messiah, the Prince of princes in the Gihonic age; the advent of Messiah, the Prince, in the Pisonic age; the advent of Messiah as the son of man in the Pisonic age; and the advent of Messiah as Jesus, the Christ, in the Pisonic age. It further contains the regeneration of the creature world, the many in the One, through the Bread of Life, thereby confirming the ministrations of the priesthood of Melchizedek. It also identifies Messiah, begotten as the Son of God in the beginning of the Euphratic age, with Jesus, the Christ, born of the Virgin in the Pisonic age. It further shows the method of applying astronomical symbols in the elucidation of universal history, thereby establishing the harmony between God's great Plan for the overthrow of every unrighteous element, as Mosaically revealed in our Bible, and the symbolism of celestial bodies from the beginning of the Creation to the end of Time as revealed from the Bible of the Ancients.